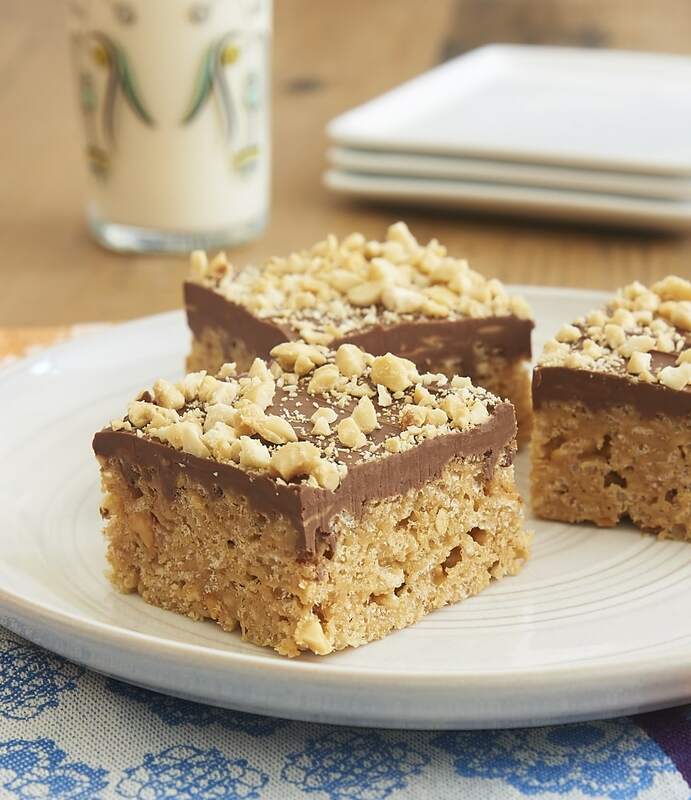 I’m sure most of us feel a wave of nostalgia just at the thought of crispy treats. I certainly ate my fair share of them in my childhood. Now that I can make them myself, I can’t resist trying variations of them to keep them even more fun and interesting. I recently found this recipe in a magazine and was instantly intrigued by the ingredient list. No marshmallows! 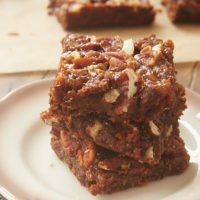 Instead, these bars are sweetened mostly by honey, with peanut butter helping to hold them together. There’s also more peanut butter and some chocolate here to make them extra good. I didn’t stray too far from the original recipe. 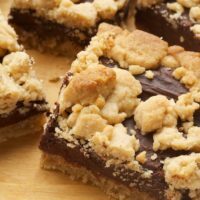 The original topping was a combination of chocolate chips and butterscotch chips. In my experience, there are very few good butterscotch chips out there. If you have a brand you like, you can certainly go that route. I decided instead to up the peanut butter ante by combining peanut butter chips with chocolate for the topping. As is the case with most crispy treat recipes, you’ll want to work fairly quickly once they’re mixed and ready to spread in the pan. 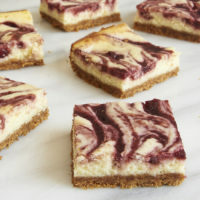 After that, though, you’ll just need to do a little microwave melting and nut chopping for the topping. So quick and easy! These bars were a big hit, judging by how quickly they disappeared. 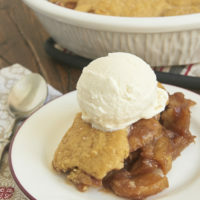 The combination of flavors, the gooey honey, and that crispy crunch is irresistible! 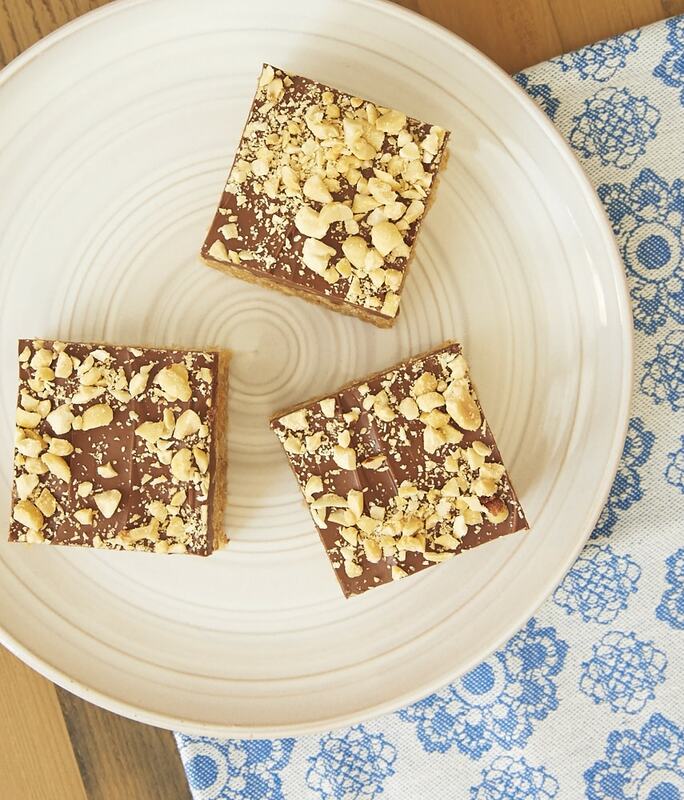 Honey and peanut butter stand in for marshmallows in these irresistible Chocolate Peanut Butter Crispy Treats. Grease a 9″x 13″x 2″ baking pan. Combine the honey and sugar in a large saucepan over medium-high heat. Bring just to a boil. Remove from the heat. Add the peanut butter, stirring until combined. Add the cereal, and stir until thoroughly combined. Press the mixture evenly into the bottom of the prepared pan. Place the chocolate chips and peanut butter chips in a large microwave-safe bowl. Heat at half-power in 30-second increments, stirring after each interval. Repeat until the chips melt when stirred. Stir until smooth. Spread the chocolate/peanut butter mixture over the top of the bars. Sprinkle the peanuts over the top. 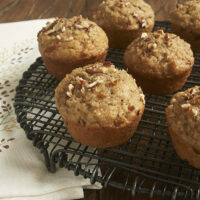 Allow the bars to sit at room temperature until the topping hardens. Then cut into bars. 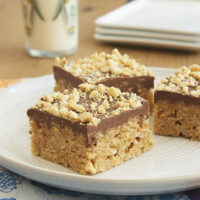 I have my Mom’s recipe, I think it has corn syrup instead of honey and the chocolate is mixed into the rice krispy’s. But it is similar. Wait a minute, so no marshmallows but MORE peanut butter? Heck yea! oooh that is cool that these don’t have marshmallows! I bet the honey complements the pb and chocolate beautifully! I love that this doesn’t have marshmallows…which means no HFCS and other unnatural ingredients. (Well maybe some in the rice krisps, but one can get those organic). Yum! Yes! 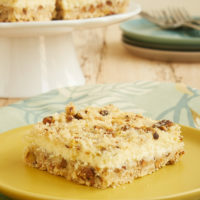 One of my favorite crispy treats recipes!